- Gildan 8.0 Ounce Youth 50/50 Heavy Blend 8.0 Ounce Crewneck Sweatshirt. - 8 ounce fabric with set-in sleeves. - 1x1 rib with spandex. - 50% cotton/50% polyester preshrunk fleece knit. 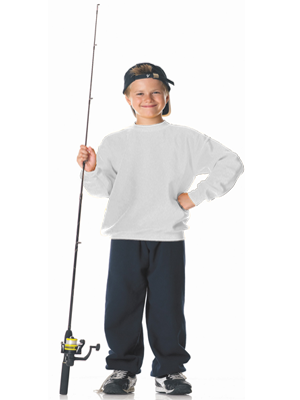 Gildan 8.0 Ounce Youth 50/50 Heavy Blend 8.0 Ounce Crewneck Sweatshirt. 8 ounce fabric with set-in sleeves. Quarter-turned body. 1x1 rib with spandex. Double-needle stitching throughout. 50% cotton/50% polyester preshrunk fleece knit. ANSI/ISEA certified as background material for Safety Green. Tear away label. Youth sizes. New improved specs. Longer body. CPSIA tracking label compliant. Tear away label. Sizes: S-XL. Heathers: Ash. Colors: Light Pink. Sizes: XS-XL. Neutrals: White. Heathers: Dark Heather, Graphite Heather, Sport Grey. Colors: Black, Forest Green, Garnet, Maroon, Navy, Red, Royal, Safety Pink.